Embryo grading is a skilled job even with the latest technology. One of the big challenges in fertility treatment is choosing which of the embryos should be transferred. Often as a patient you are told about Embryo grading but may be unsure about what that means and the are implications for the baby. So we spoke to Charlotte, an embryologist at Bourn Hall Clinic, to find out what embryo grading means. During IVF treatment there is often a lot of discussion about embryo grading. This is an index used to help embryologists decide which embryo has the best chance of success and therefore which one should be transferred. Patients should be reassured though that the grade of the embryo is not a way of predicting the health of the baby. We have seen many perfectly formed and healthy babies result from embryos that were classified as lower grade. 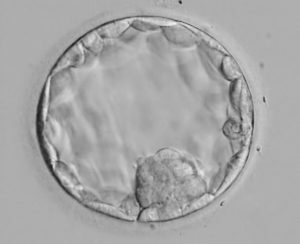 In some cases the embryos are allowed to develop in the incubator for a couple of days longer, until they reach what is known as the blastocyst stage at around day five. Not all embryos will be able to reach this stage, but evidence suggests that those that do are particularly strong and likely to have the best chance of successfully implanting in the uterus. 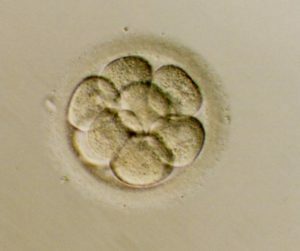 IVF techniques are improving all the time, so more often than not embryologists must select one embryo for transfer (or two in certain circumstances) from a group of several that are all at the right stage. For this reason, embryos are carefully assessed with a microscope every day and graded according to their appearance. An embryo starts as a single cell and as it develops, the cells continually divide so that a two-cell embryo (2C) becomes a 4-cell embryo (4C), which becomes an 8-cell embryo (8C) and so on. Each embryo will develop at a slightly different rate, but usually by day four an embryo will have over eight cells which will be tightly packed together. In a ‘perfect’ embryo the cells will divide evenly, so that each cell appears to be identical in size and shape. It is thought that embryos with very even sized cells have the highest chance of successfully implanting in the uterus, so these embryos are given the highest grade. At Bourn Hall Clinic, we grade embryos on a scale of one to four, where four is an embryo with very equal-sized cells and one is an embryo with very unequal-sized cells. For example, an eight cell (8C) embryo with very equal sized cells will be classified as grade four (8C-4), but an 8C embryo with very unequal sized cells will be classified as grade one (8C-1). If you imagine dividing a biscuit in half, it is likely that no matter how careful you are, you will nearly always make some crumbs. The situation is similar for the cells of an embryo and sometimes when they divide they leave small fragments behind. For this reason embryos are also graded on a scale of one to four according to the amount of fragmentation. Embryos with no or minimal fragmentation are thought to have the best chance of success and are therefore graded the highest (grade four). Some clinics use slightly different scales to grade embryos at this stage, so you may have to ask your clinic what system they use. After about 5 days, embryos reach the blastocyst stage and the number of cells can no longer be counted. 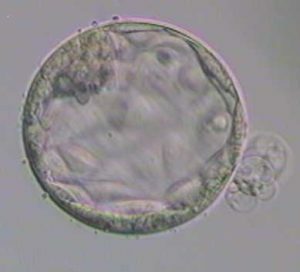 This means that the method of grading the embryos must be changed. Blastocysts are given a number from 1 to 6 which represents how quickly they are developing; this is known as the ‘expansion status’. Stage one blastocysts are the smallest and so these embryos are growing a little more slowly than those at stage three or stage four. Stage three embryos are described as being ‘full blastocysts’, and by stage five, embryos have started to ‘hatch’. You may not be aware that human embryos must hatch, but this is a very important stage which allows the embryo to attach itself to the inner lining of the uterus. Stage 6 blastocysts are fully hatched. It is possible to transfer a blastocyst at any of these stages, however a blastocyst that has started to hatch is thought to be particularly vigorous and should have the greatest chance of success. What becomes what in an embryo? Blastocysts look like a ring of cells with a small ‘clump’ of cells inside. This outer ring is called the ‘trophectoderm’ and this will become the placenta that will protect and nourish the developing baby. The ‘clump’ of cells inside is called the inner cell mass (ICM) and it is these cells that will develop into a baby. The appearance of both the inner cell mass and the trophectoderm is graded using letters with grade A being the best. When looking down the microscope the inner cell mass should be very obvious and the cells in the trophectoderm should be small and identical. If the inner cell mass is small or if the cells of the trophectoderm are large and different shapes, then the blastocyst will receive a lower grade. Stage five blastocysts (hatching) with A grades for both the inner cell mass and the trophectoderm (written as 5AA) are thought to be ideal for transfer. Sometimes the trickiest decision is whether to select an embryo that is well developed but doesn’t have a perfect grade, or to select a slightly less well developed embryo that has an AA grade. It is likely that both these embryos have an equally high chance of success, but it can still feel like a big decision to make. Embryologists always ask each other for advice and everything we do is checked by a second, highly experienced embryologist. This means we can have absolute confidence in the service we provide and know that we are giving every patient the greatest chance of success that we can. The most important thing to remember is that although embryo grading can be helpful in determining which embryos have the greatest chance of success, unfortunately there is no way to know for sure if a very high grade embryo will result in a pregnancy. Similarly, you should not feel disheartened if you are told your embryos are not of the highest grade. There is still a good chance that in nine months time, the embryo selected for transfer will have become a perfectly healthy bundle of joy and its grade will have become irrelevant. When we posted this blog on to FaceBook it got all these messages of reassurance. Here’s mine 5 days after ICSI. It grew into an amazing boy who is now 4. Incredible 1st baby picture! My twins were blastocyst grade 4ab and 4ba! 2 healthy 2 year olds now! Stacey Thurston-Woods I have 2 bourn hall babies (4 months and 2.5 yrs) and both were 5BBs but I don’t have any pics like this. Would be amazing to see! How blastocyst culture improves success rates. If you would like to discuss IVF do contact us.